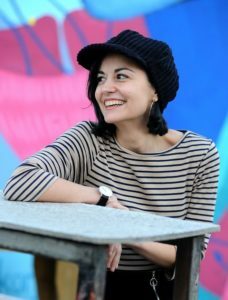 Lana Bastašić (Zagreb, 1986) is a Bosnian writer. She studied English Language and Literature and holds an MA degree in Cultural Studies. She has published two collections of short stories, one book of children’s stories, and one of poetry. “Catch the Rabbit”, her first novel, was published in 2018 in Belgrade, Kontrast, and was shortlisted for the NIN award. Her short stories have been included in major regional anthologies throughout former Yugoslavia. She has won the Best Short Story Award at the ‘Zija Dizdarević’ competition in Fojnica, Bosnia; the Jury Award at the ‘Carver: Where I’m Calling From’ festival in Podgorica, Montenegro; the Best Short Story Award at the ‘Ulaznica’ festival in Zrenjanin, Serbia; Best Play by a Bosnian Playwright Award at the competition organized by Kamerni teatar 55 in Sarajevo, first award for best unpublished poetry collection in Zrenjanin, and Targa UNESCO Prize for poetry at the Castello di Duino festival in Trieste, Italy. She collaborates with various literary magazines in the Balkans, most notably Polja, Povelja, Sarajevo notebooks and Putevi. In 2016 she co-founded Escola Bloom with Borja Bagunyà and she co-edits the school’s literary magazine Carn de cap. She lives and works in Barcelona.